Set out the shark's friends and listen for the clues. Who has eight legs? Who is green? Race to the right friend, catch it with the shark, then shake, shake, shake to see if you found the right one! 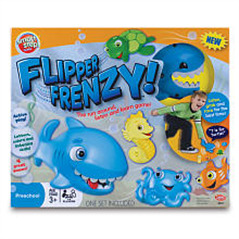 Four levels of run-around fun so the game grows with your child! How about having some fun while helping your little nieces and nephews develop their coordination and early learning skills? We thought you'd like that.